Open by bookings only. For weekday availability please call us. CINCINNATI’S HOME FOR FAMILY FRIENDLY ARCHERY DODGEBALL! Family-friendly Archery Dodgeball that everyone can enjoy! No previous archery experience required. Our skilled staff will train all players thoroughly prior to each game! Perfect for Team Building Activities, bachelor parties, birthday parties and corporate events! Looking for great team building activities? Looking for a unique birthday party, bachelor party, or date night? Look no more! Combat Archery is a fantastic sport that everyone can enjoy! 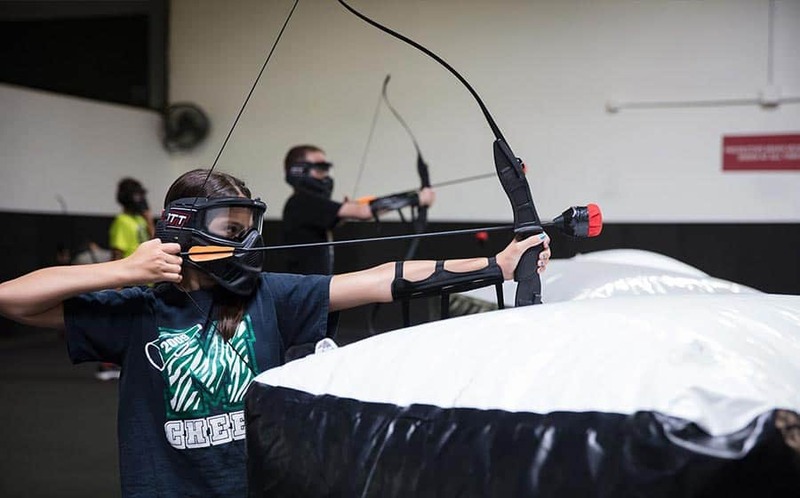 Combat Archery (Archery Tag) is a lot like the game of dodgeball, only with specialty made foam tipped arrows! The ultimate objective is to eliminate the other team by tagging them with arrows. 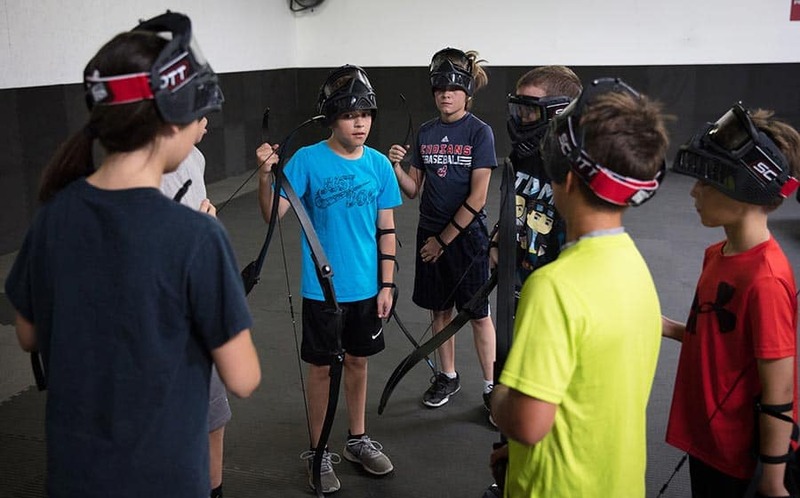 Combat Archery is safe and fun! The impact of an arrow feels very similar to getting hit in dodgeball! Combat Archery is perfect for team building and makes for a great birthday party, bachelor party or date night! OVER 100 5 STAR REVIEWS! We train every group prior to games! Combat Archery is an epic adrenaline rush unlike anything you have experienced. It combines the classic game of dodgeball with the thrill of paintball. Combat archery is a safe and unbelievably exciting experience that becomes more challenging as the game goes along. 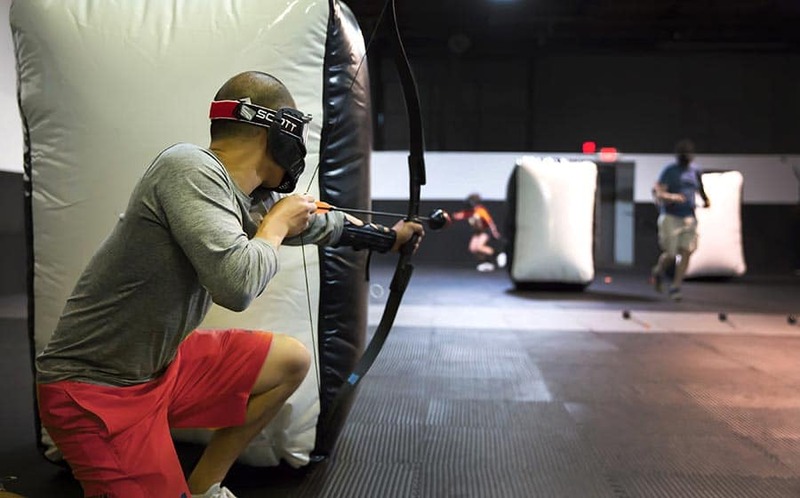 Combat archery is perfect for company team building activities, bachelor parties, family night out or date night! We train every group prior to games! Combat Archery is an epic adrenaline rush unlike anything you have experienced. Combat archery is a safe and unbelievably exciting experience that becomes more challenging as the game goes along. 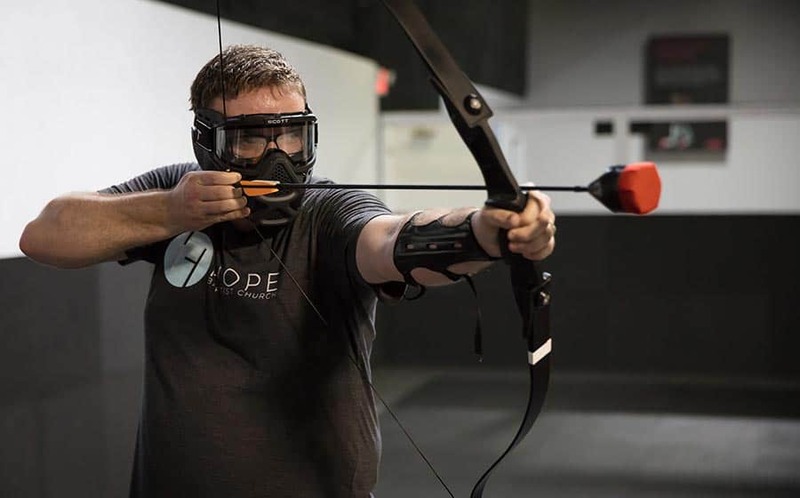 Combat archery is perfect for company team building activities, bachelor parties, family night out or date night! Advanced Bookings or Reservations are required. Either book online or call us to make a reservation. We are open by bookings only. You can book individual tickets, group tickets, or memberships through our website and mobile app. We recommend booking a week in advance to ensure availability for you or your group. Players must be 10 years of age to play. Youth games available starting at age 7. Email or call us for youth hours. You must be in good physical condition to engage in this sport. If you are pregnant or think you might be pregnant you will not be allowed to play. All participants must read and sign our online Waiver and Release Form as a condition to play. Parents of players under 18 must sign the waiver online or on site to allow them to play. Sign the waiver here: Sign Waiver. Each booking includes an hour of game play, including archery training. You will get to experience a variety of game modes during your experience. As time goes on the game modes become more and more exciting and at the end a champion will be crowned! Please arrive 15 minutes earlier than your booked time for training and check in. 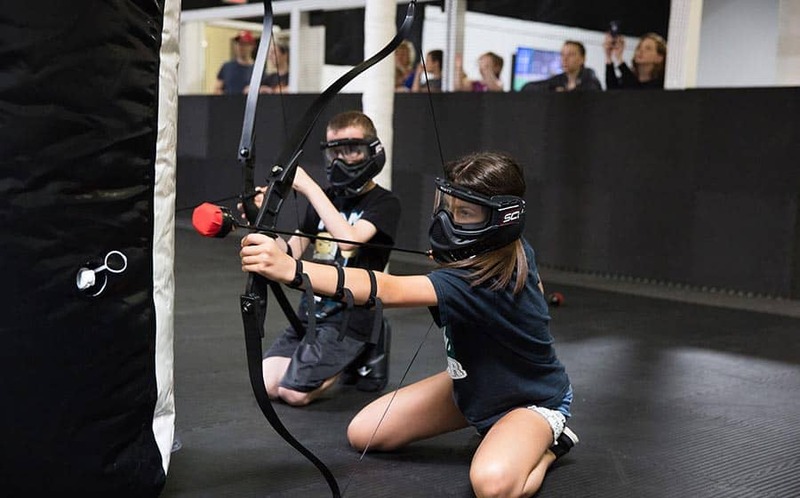 When you think Archery Arena, think dodgeball, but with bows and arrows. We use heavily foam tipped arrows, which makes the arrow impact feel similar or less than a dodgeball! Players wear paintball masks and arm guards for protection. No! You can purchase individual tickets and you will be placed into a public game with other groups and/or individual players. Meeting new people and sharing a new experience is part of the fun. This game tends to turn strangers into teammates in a short period of time! While you don't have to have a group to play, we do reserve the right to reschedule or refund your booking if our minimums are not met for the hour. 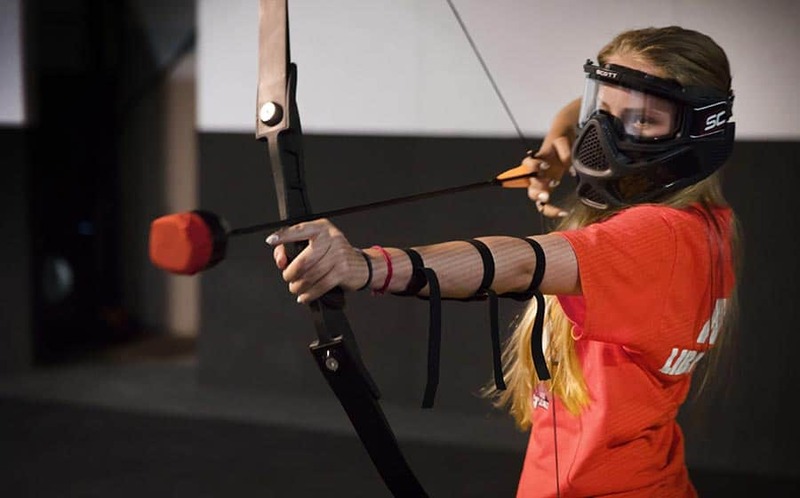 Archery Arena is great for team building, birthday parties, bachelor/bachelorette parties, and corporate events. We have several group packages, please visit our group rates portion of the website or call or email us for more information. No experience necessary! Its actually rare we have people with archery experience! Our staff fully trains everyone prior to combat! Archery Arena is for people of all experience levels. Your game ticket includes a short training session that will have you playing like a pro in no time! - If you wear glasses, we recommend wearing contacts if you have them. This is not required, it will just be more comfortable for most. If an emergency arises, we will work with you to reschedule your time slot. No refunds or store credit will be given for no-shows. If you are late, it will cut into your play time. If you are exceedingly late, it may cause your booking to be rescheduled. Like sporting events, escape rooms, and other attractions, we do not give refunds under any circumstances. You are expected to arrive 15 minutes before your scheduled time in order to check in and receive instruction. If you are late it will cut into your play time. If you are exceedingly late your booking may be cancelled or rescheduled. No refund will be given to no-shows. MUST CALL/EMAIL TO BOOK WEEKDAYS OR UNPUBLISHED HOURS. A minimum of 4 players required for a game during open play hours. If the minimum is not met your reservation may be cancelled or rescheduled.